Steelhead trout with tangy ginger mayonnaise. I thought I would post an update on one of more advantageous “on sale” finds from a few days ago. I had found a frozen steelhead trout whole fillet at 30% off. I imagine this trout put up quite a fight! The entire fillet (about 18” long and over 1” thick) was regularly priced at close to $6.60. With the 30% reduction I paid $4.40 for half a large(-ish) fish. It must have just been hanging around a little too long for the grocer’s liking because there was nothing wrong. It just had to be cooked within days. 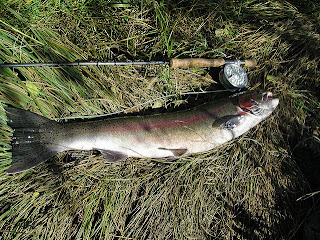 Steelhead trout is a variety of rainbow trout that lives most of its life at sea. We fish rainbow trout in the rivers and lakes here in Nova scotia. Lake trout are much, much smaller and a welcome springtime delight. Serve with a dandelion greens salad for a real treat! Sea-grown steelhead are bigger – obviously. This was no small fillet. 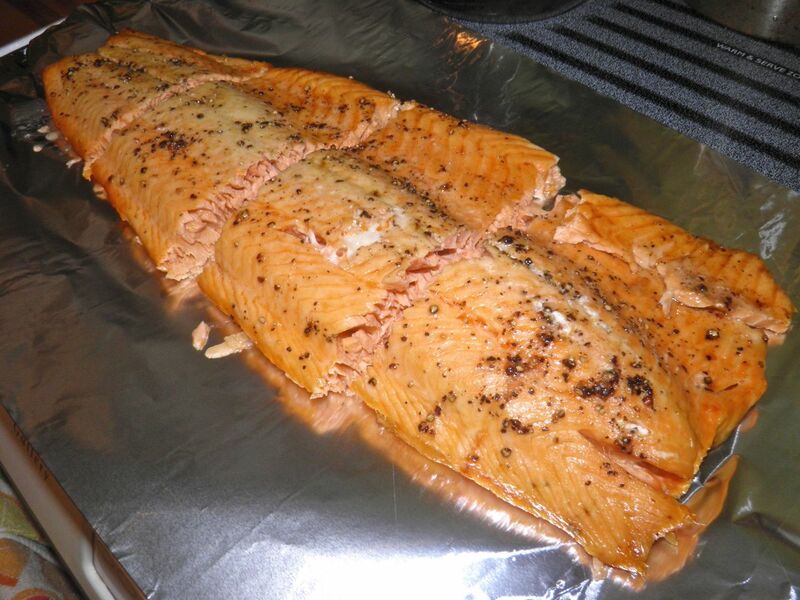 Steelhead is extremely similar to salmon in both texture and taste. In a blind taste test most people cannot tell any discernible difference. There’s a couple practical reasons for adding steelhead to your diet as well. Salmon is not cheap fish and is getting more expensive all the time. Problems with aquaculture, habitat change due to climate and overfishing are driving up the price of wild salmon. Also, steelhead is an ecologically sound choice. It's in the “Best Choices” of the Seafood Watch List published by the Monterey Bay Aquarium in California. That institution monitors world fish populations for overfishing. Since steelhead is so similar to salmon you can use it in any recipe that calls for the more expensive fish. I purchased my fillet during a lunch hour last week. By the time I got home it had partially thawed out. So I was stuck with having to cook it all at once. No problem with what to do with the leftovers. 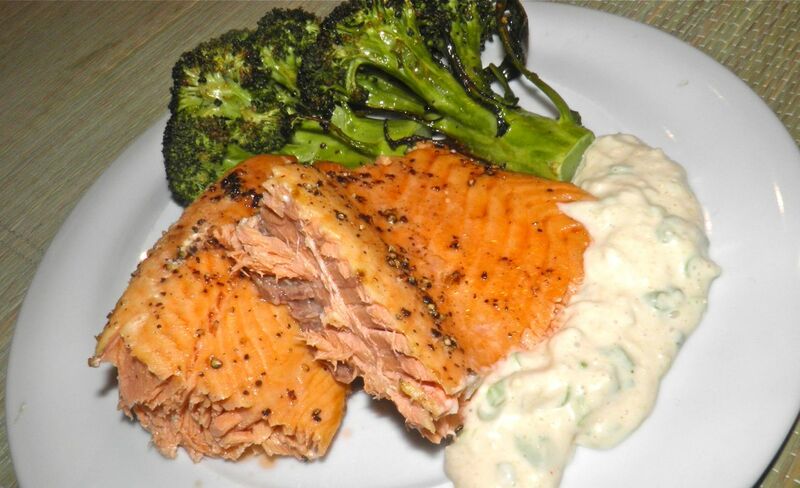 A quick google search turned up 7 million recipes using pre-cooked salmon. Since I wasn’t sure how I would use the leftovers I opted for roasting it in the oven – simply rubbed with a little olive oil and sprinkled with salt and pepper. It tasted quite a lot like planked salmon. To give you an idea about how much fish this was take a look at the picture. I was able to cut it horizontally into four large equal pieces. Each of those could/should be divided in two again. So for $4.40 I had eight (8!) fish servings. Cold salmon (or steelhead) is a great summer dish, but I have also served cold salmon at a Christmas buffet. It certainly is a time saver at that busy time of the year. You can prepare the fish a full day ahead and then refrigerate until ready to serve. Pick a simple cold sauce for accompaniment and you’re ready to go. A standard with fish is dill, but this time I opted for a ginger sauce. It was fresh and delicious with the still barely warm fish. From now on when I walk past the frozen fish at the grocery I’m going to take a closer look. Even at $6.60 the filet was a steal. The 30% off was just the icing on the cake! The mayonnaise mixture makes about 1 cup. Preheat the oven to 350°F. Rub 1 tablespoon of olive oil on the surface of a rimmed cookie sheet. Place the filet skin side down and rub the top with the remaining oil. Sprinkle liberally with salt and cracked black pepper. Roast the fish in the centre of the oven until cooked through. This will probably be about 30-40 minutes. You can tell when salmon/trout is cooked by inserting a fork in the fish and gently turning it slightly. If the fish comes apart in flakes and you cannot see any red (just pink) it is done. If you overcook the fish it will be dry. To remove the skin from the fish push a spatula between the flesh and skin while still in the pan. They should separate with ease. To make the sauce grate the ginger and place it in a small bowl. 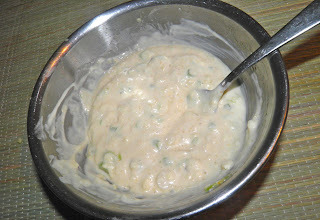 Add the diced green onions, rice vinegar, mayonnaise and salt. Let sit for 10-15 minutes before serving.